Don't settle for one distortion pedal when you can have 3 built into one stomp box! 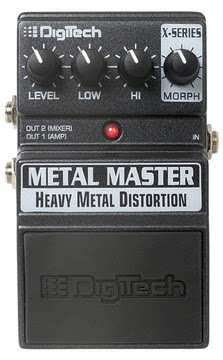 Introducing the Metal Master pedal from DigiTech. This pedal will give you the arsenal you need to tear the heads off of your crowd! Use the Morph knob to morph between a smooth high gain tone, to a scooped midrange sound, all the way to a punchy mid range heavy metal sound that will cut through ANY mix! You strive to make your music unique and DigiTech gives you the power to create that unique sound in one pedal. In order to give you more options than anyone else and further refine your tone, DigiTech put in separate low and high spectral-contouring EQ and dual amp/mixer outputs with optional cabinet modeling circuitry. All of this in a rugged metal chassis that will stand the abuse of the road.